All models are still repairable even if they are out of warranty. Your model can be repaired for just the cost of signed return mail shipping & handling in most cases for as little as $11.00. We will make change for any cash submitted over this amount up to $20.00. PrivacyCall or Globalinx model repairs are $20.00. Please contact us at 877-610-5693 for an RMA to return your unit for servicing. If you're interested in ordering via mail instead of the e-com site, please use the address below to place your order. Send a US Postal Money Order for the amount calculated in the order page with your return address. Please enclose the Order Page, if you can print it out. Thank you. Email Policy: Digitone encourages you to stay on topic, avoid profanity, offensive statements and keep in mind that we reserve the right to: (but are not obligated to and not limited to) edit or delete your comments and may not respond at all, depending on the request. Please avoid posting private or confidential information. We receive many detailed email requests daily and some require more time to answer. You will have a better opportunity to get your questions answered by calling 877-610-5693 during our normal operating hours which are M-F 8:00 AM to 5:00 PM, Pacific Time, except national holidays. However, our Frequently Asked Questions page has most if not all the answers to all related product and company questions. This is where you should start. Otherwise, allow up to 48 hours and National Holidays for us to respond to requests submitted. If your question is answered by the FAQ's page then it will be referenced directly. We offer email support as a courtesy to our customers who need help with their Digitone product or additional information not already covered by Digitone's web sites or manuals. We will not respond to emails that contain problematic situations or show adverse attitudes or response entitlement. Please conduct yourself professionally when making requests to our email support department. We understand that unwanted phone calls into your home or office on a daily basis violating your privacy can be enough to drive you to be very upset, but it's better for us both when you can email your request in a courteous manner. Thank you. 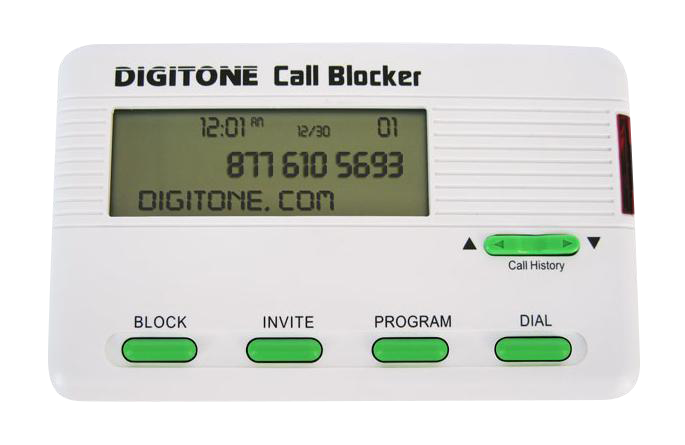 The Original Phone Call Blocker - Block all unwanted calls with Digitone's ProSeries Blocker model. The ProSeries Blocker can block calls from Cell Phones, Faxes & Telemarketing Numbers 800, 855, 866, 877, 888 and Exchanges like 555 and 000 not blocked by the National Do Not Call registry or your Telephone Service Provider. Works with your Caller ID Service to Automatically Eliminate All Unwanted Callers! Block calls originating from any country or area code. Blocks Any Number From Anywhere! Block Whole Area Codes or Individual Numbers. Guaranteed To Block Cell Phones, Pay Phones, Calling Cards, Unknown, Anonymous, Unavailable and Out of Area Callers. Works in Mexico, Canada, and with All U.S. Phone Companies with standardized phone lines, FIOS, DSL, Cable modems or VoIP Phone Adapters from Vonage, Magic Jack, Skype, Ooma & Cell Phone Wireless Gateways. Available here at Digitone's OrderPage or at Amazon.com. There are No Fees to own these devices. Note: We are not a call blocking service. We only sell Call Management products for your home or office. Also, to utilize the Free National Do Not Call Registry, go to Do Not Call Registry to list your phone numbers on the donotcall list or FTC Federal Trade Commission to report any violations. These award winning call blocking devices are built to withstand any harassing phone caller calling from anywhere. Copyright 1990-2018 Digitone Communications Registered in United States Patent & Trademark Office / All rights reserved.